Get 30% off your next order and pay only $9.99 S&H! Just place an order of $300 or more and use promotion code GWGS. Hurry—this offer ends May 31, 2019. Call 800.333.3032 or order online at kramesstore.com. Prices and availability subject to change. 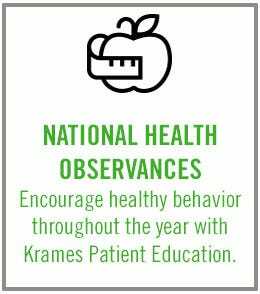 The savings offer expires May 31, 2019 and applies to Krames Patient Education print products only. KramesArt, Freedom From Smoking® Plus, electronic, and custom products are not eligible for discount. Offer cannot be combined with volume or other discounts. Minimum order of $300 (before imprinting/shipping charges) required. 1 Llewellyn A. Shared decision making: empowering patients through education and collaboration. Go Practice blog. November 13, 2018. https://gopractice.kareo.com/article/shared-decision-making-empowering-patients-through-education-and-collaboration. Accessed February 20, 2019.